The Cartoon Network may not have any Star Wars: The Clone Wars episodes to air any more, but that doesn’t mean there is no Star Wars – the network will air episodes of the web series LEGO Star Wars: The Yoda Chronicles starting next Wednesday, May 29th at 8/7c with a 30 minute premiere, “The Phantom Clone”. Two more episodes will air later this year. To celebrate, LEGO took over Times Square and unveiled a life-sized X-Wing constructed from LEGO bricks – over 5 million of them. It took 32 master builders 17,000 hours to construct it, and they used the actual X-Wing kit blueprint to do it! The X-Wing will spend a couple days in Times Square, and then it will be relocated to LEGOLAND in California. 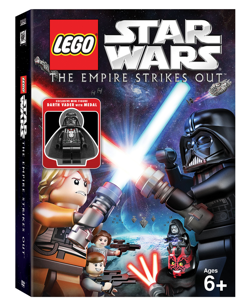 Get your lightsabers and LEGO bricks ready because your favorite characters are back in the brand new LEGO Star Wars special, LEGO Star Wars: The Empire Strikes Out. Catch up on what’s happening in the galactic LEGO Empire with these tidbits about Lego Star Wars: The Empire Strikes Out with a fun catch-up on its predecessor, The Padawan Menace. On top of all the old Star Wars characters making their debuts as LEGO characters, you will also see more references to the franchise films than ever before, so keep your eyes peeled Star Wars fans.